Update: The contest part of this post is over but please enjoy the free knitting pattern. A lot of people think of knitting as only a cold weather activity, they think of wool sweaters, mitten and hats. But I see no reason to give up my favorite craft when those hotter temperatures roll in. That is when I pull out the cottons and linens to knit up little cardigans, tanks and shawls. 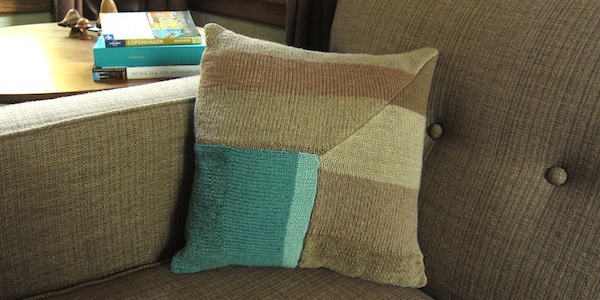 It’s also the perfect time to knit up items for your home, like this striped pillow. 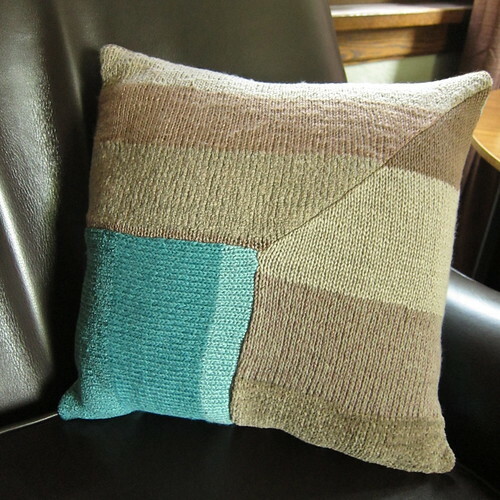 This pillow is such an easy knit, just straight stockinette and easy decreases. What gives it so much more style is the yarn, Feza Alp Natural. I’m not typically a fan of “novelty” yarns, but this yarn is so different from those polyester fun furs. Alp Natural is a hand tied yarn made from cotton, viscose, linen and silk. As you knit the yarn changes from cotton chenille to silk cord to boucle to linen and so on, while staying in the same color family. This gives you tone on tone stripes with lots of texture. The yarn itself has so much interest that you don’t need to (or really want to) use it for a complicated pattern. It calls for large amounts of stockinette to show it off. It would be great for bags, flowy cardigans, shawls and blankets. It can be a little tricky to get a consistent gauge with the different yarns, so I would suggest using it for something that doesn’t have to be closely fitted. Now, for the giveaway. 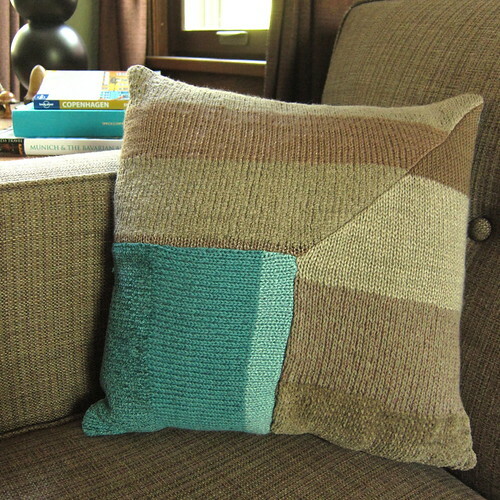 Thanks to Feza Yarns we have a skien of both the tan and blue used to make this pillow to giveaway to one reader. There is enough yarn on these skeins that you should be able to make two pillows by switching the colors. 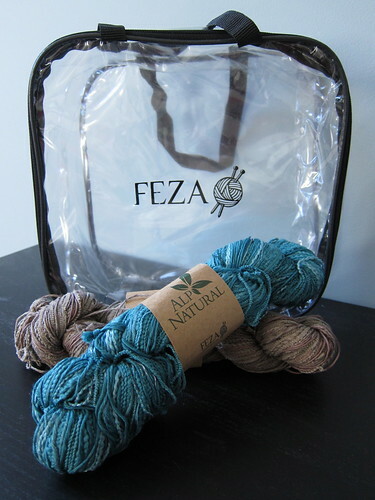 Not only will the winner get the yarn, but also a Feza project bag. All you have to do to enter is leave a comment on this post telling us if you would knit this pillow with the yarn or if you have another pattern in mind for it. Make sure to leave a viable email address when you comment. Please only one entry per person. We will randomly pick on winner on Monday, July, 2nd. Work in stockinette until piece measures 7 inches. 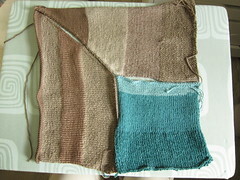 For the rest of the piece you will decrease on two rows and then do one row straight until there is one stitch left. Piece 2 should be about 14 inches long. 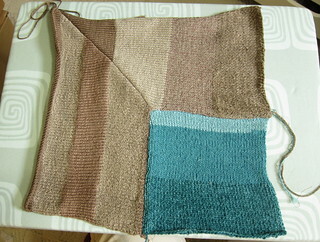 For the rest of the piece you will decrease on two rows and then do one row straight until there are 42 stitches left. Steam block the pillow front pieces with an iron. Pin the pillow pieces together with right sides facing each other. Sew all the pieces together with a 1/2″ seam allowance (or as close as you can get, its a little trickier getting an exact seam allowance size with rolling knitting edges, err to the smaller size , 1/4″ – 1/2″). I found it was easiest to sew the diagonal seam first and then attach the blue square. Steam block again. Press the diagonal seam open. The straight seams can be just pressed to one side. 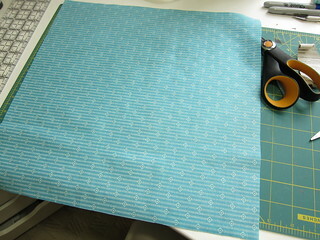 Cut your backing fabric into a 14″ x 14″ square. Pin the fabric back of the pillow to the knit front with right sides facing each other. Stretch the knitted piece if needed an use lots of pins to make stay in place. Sew the pieces together on three sides with a 1/2″ seam allowance. It was easiest to sew with the knit side up to keep the knitting from rolling. Sew a portion of the fourth side leaving enough room to put the pillow insert through. Turn the pillow right side out. Pull the corners out at much as you can, they will never be pointy because of the amount of fabric. Put in the pillow insert. Hand sew the opening. ***Disclaimer: I was provided with samples of Feza ALp Natural to knit and giveaway. I was not told what to write or compensated in any other way. 7 years ago by Kat in Giveaways and Contests , Knitting , Knitting Projects , Needlecraft , Projects , Sewing , Sewing Projects | You can follow any responses to this entry through the RSS feed. You can leave a response, or trackback from your own site. I love the colors. I’m not sure whether I would use this exact pattern or not (I’m pretty new to knitting) but it doesn’t seem too complicated for me so maybe. Thanks for the opportunity to win! I’d totally knit this pillow. I love throw pillows and most of the ones in the living room are the ones that came with the couches. The blue and brown are a surprisingly nice fit with my sort of southwestern living room. I love those colors and would probably choose a pattern that’s a little easier so that I would actually finish! I love making objects that don’t have fit involved! I think this could make a super cool striped pillow….that is if I won the yarn! Love the colors, I just started knitting so this mite be a little over my head. I definitely would consider knitting the pillows or a small striped afghan for one of my grandchildren (not here yet, due in November). This yarn would be perfect for an infant . Although I must admit thSt the pillow is beautiful. I would live to use the yarn on a pillow, but maybe use a different pattern. Would be a great gift for a friend who loves these colors! I would knit the pillows, but I would knit one brown pillow and one blue pillow. I love the colors! I’d love to win! Thanks for the chance! I love to knit and am always on the look out for small take and go projects. I love the unusual design and the pop of turquoise color. Count me in. This is probably the first “Novelty” yarn I have ever been interested in. And I am very, very interested. Cotton, Viscose, Linen, Silk, except for the viscose all very natural and the viscose is made from tree pulp. It is a “man made” fibre, but unlike polyester it breathes. I just want to get my hands on this yarn and squish it. I would make the pillows, but like Michelle, I would make one brown and one blue. Thank you for the chance to win. Yes, I would knit the pillow, but likely with stripes. I would give this pattern a try also. Bit concerned about the seaming though. Oh my gosh! I think I would make this pillow–the colors are exactly what I’ve used to decorate my living room! Very beachy! I would make a purse out of those colors or make the pillow. The colors are fabulous. I would probably make some of my chemo caps with this yarn. I love the colors. Probably would make a different pillow with it. I love those colors! I probably would knit a shawl or scarf with it! I think that is the most cool awesome pillow ever I love the blue and Tan if I won this I would be so excited.I would make the pillow or a Purse or probabaly anything! 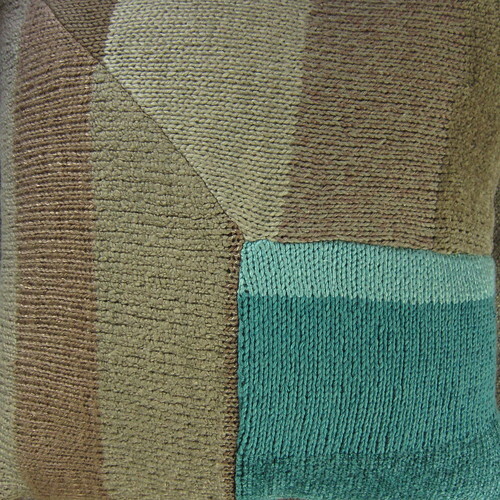 I would love to knit the pillow using the blue and tan. It looks like gorgeous yarn! Plus, I just painted my studio room in blue and tan. The pillow would make a nice addition to the room. Amazing! My wife and I were just talkjng about pillows for our bed and couch. These colors are a pedfect match and the design is also right on for our decor. The pattern looks pretty simple, too. I’m the knitter and wojld lkve to give the yarn a try. Thanks for the pattern and the opportunity to win. Nice colors…would love to knit the pillows. I have never tried to knit pillows so this would be a challenge for me. I also love how soft and warm the yarn looks. Hope I get the opportunity to win thanks.